It's a parody of Giant Robot anime in which the robots are cute girls. There's a lot of it about these days. See also Kantai Collection (battleships are cute girls), Upotte!! (assault rifles are cute girls), Hetalia (countries are pretty boys), etc. If you want weird anthropomorphisation, watch more anime. It's a goofy idea and they're putting plenty of energy into it, but it's oddly hard to like. The heroines are unpleasant and the only likeable characters are the ineffectual villains. Z-chan (Mazinger Z) = ginger, hot-headed, destroys large areas of cities because she unleashed her Photonic Beams even after the enemy had been defeated and were running away. When there are no villains around in sub-episode 3b, she gets bored and says she wants to punch someone. Gre-chan (Great Mazinger) = sullen, cynical brat. Grenda-san (Grendizer) = the mother-figure of the team, with a lovely, gentle manner that doesn't stop her saying and doing bad things. "Let's cheat too!" Sub-episode 1a suggests that she's a sadist. That said, though, she's still the most likeable non-villain because she's a massive fan of the former idol Rhine X1 and will do anything to make her feel better and more positive about her singing. Admittedly that singing is so bad that it will melt speakers, shatter microphones and topple buildings, but Grenda-san is a true fan and won't hear a bad word about her beloved. I don't think it's even self-delusion. She genuinely thinks Rhine X1 sounds good. Mind you, even in a comparatively heartwarming sub-episode like that, the lyrics to the songs being sung are all about evil, selfishness, helping no one but yourself, etc. Supposedly heroic, but their rivalry with Team Z in sub-episode 2a once again flattens half the city, almost certainly causing civilian casualties. I have a particular shot in mind. This duo are actually funny. I'd have even called them memorable if they'd been around for more than about five minutes. One of them is a sincere hero with intense hero dialogue (sneered at by Team Z for being cheesy) and the other is a beautifully-spoken rich girl who'll turn into a raging demon of vengeance if you get mud on her dress. I don't think they're bad enough to work as comedic sociopath heroes, but then again they're certainly not nice. Gre-chan makes little Doublas cry when she takes away her hand puppets, for instance. There will be occasions when they show a more human side (e.g. Gre-chan's tears at the possibility of losing Z-chan in sub-episode 2b), but such moments will generally be followed by something childish and bratty. There's some fanservice, but the art style's too cartoonish for this to mean anything. There's not a lot to talk about here, really. It's silly, both in execution and conception. I'm sure it would be funnier if I'd watched more 1970s giant robot anime, but hey. Some of the sub-episodes I liked, such as... actually, on reflection I think I liked all the stories in episodes 2 and 3. Z-chan's little sister and her dual personality were amusing. Grenda-san made me laugh as a fangirl with the world's worst taste. The Big Bad in episode 3 was fun too, as was everyone teaming up to fight her. Somehow, though, for me it's less than the sum of its parts. Partly I think it's the fact that there are too many heroes in not enough screen time, plus of course the fact that they're generally scum. 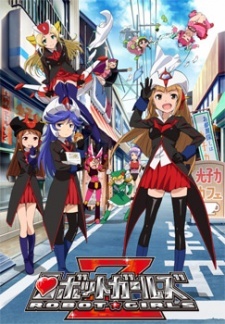 Personally I hope Robot Girls Z+ turns around and becomes a "follow the villains" show, with Baron Ashura et al as the protagonists. That I'd watch.